Inboard hydroplane racing has undergone a transformation since the introduction of the safety capsule about 15 years ago. Prior to that, drivers wore a life jacket and helmet. The drivers did not wear any kind of seat belts or other restraints, so they were often thrown out of boat into the water when things went wrong. Some boats were equipped with string attached between the driver and a kill switch, which would kill the motor when the driver was thrown out of the boat. Currently, drivers are encased in a protective safety capsule made of a Kevlar composite material that is almost impenetrable. They wear a helmet and flack suit providing additional protection to the torso. Drivers are restrained with a 5 point safety harness like those used in other motorsports. These changes have made a tremendous difference in terms of reducing injuries and almost eliminating fatalities. The sport has changed so much that many who retired from racing prior to these improvements are returning to the sport. 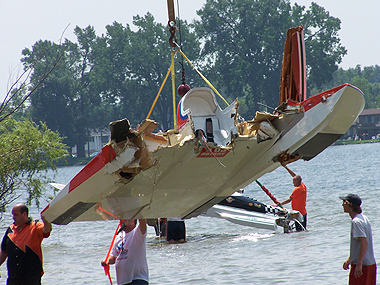 Many of the drivers today are the children and grandchildren of those returning since the vast improvement in the safety of inboard hydroplane racing. Whenever there is a driver is in the water or otherwise in trouble, there are highly trained rescue personnel. The are very effective at attending to such a driver within literally a few seconds. There are rescue teams strategically located on the course at all times the boats are on the race course. As bad as this looks, both drivers survived to race another day. However, they did have a bad day. This is just what it sounds like. This can happen when both boats try to occupy the same lane and they broadside each other. It can also happen when one boat spins out and the boats collide head on. This is when the boats enters into the turn digging in with the skid fin and the rudder looses its grip or the torque of the prop causes the boat to go into a flat spin. Sometimes the boat can spin into the path of another boat coming up on the inside. This is again in the turn, when the right front side or sponson digs into the water and the boat does a barrel roll ending up upside down. The driver must free themselves from the harness and cockpit to swim to the surface. This usually happens at the end of the straight away where maximum speed is reached. In this case the boat traps too much air underneath cause it to go airborne doing an inside out loop. It can also happen when a boat runs up a rooster tail, which lifts up the front end and again goes go airborne. Some times the boat lands up side down. If the boat does land right side up, it usually lands very hard and provides a tremendous jolt to the driver.